The concept of a character waiting for Waiting for Godot rather intrigued me. When I heard the Loudmouth Collective was presenting a play with that title at the Open Eye Figure Theatre space, I simply had to see it. Ironically, I arrived an hour early for the Press Preview and I had to wait for Waiting for Waiting for Godot (WFWFG). Sam Landman (left) and Gabriel Murphy (right) wait backstage for their moments in the spotlight. Photo by Justin D. Gallo Photography. Open Eye Figure stage was a fitting environment to stage this play. 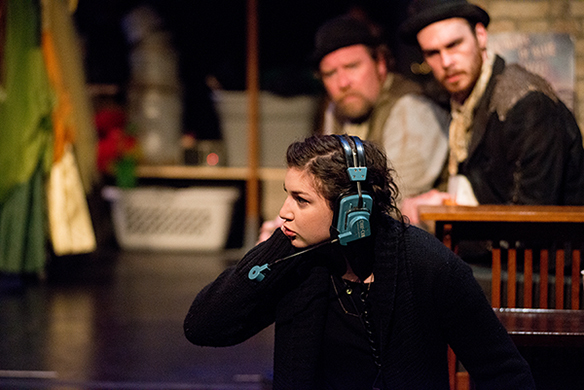 It’s small, intimate with a slight anachronistic feel that lends itself to this off-beat play. 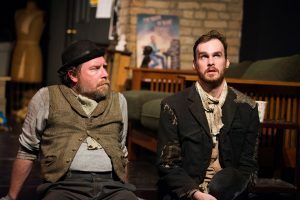 The performances of Sam Landsman and Gabriel Murphy as the two understudies are not over-intellectualized and contain a lot of physical humor. While their routines are funny, they never go over the top. But being well versed in Beckett’s work, one could sense a potential hilarity that was repeatedly missed. The entrance of Sulia Rose Altenberg as the Assistant Stage Manager, makes for a situation that almost reaches hilarious proportions. She’s in a panic because a medical emergency halted the performance of Waiting for Godot. She abruptly enters the backstage universe of the “understudies” as if she had entered the Twilight Zone. She’s taken aback. She never heard there were understudies for the play. Who are these guys and what are they doing here? She says they’ll have to talk to the director and draws the first big laugh of the show when she says the director’s not available…so they’ll have to wait. 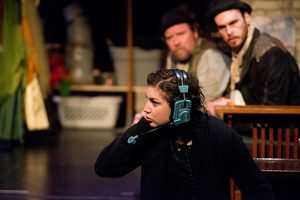 The Assistant Stage Manager (Sulia Rose Altenberg) interrupts the understudies’ concentration. Photo by Justin D. Gallo Photography. The level of intensity of this satiric moment is unfortunately not sustained and never returns. This occurs even though the audience is primed for deeper delving into the plight of the characters. 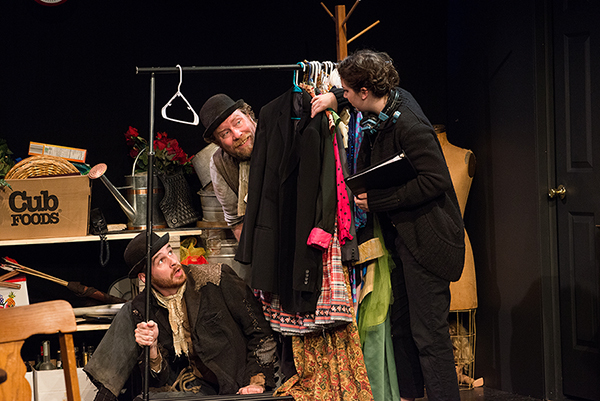 Suddenly, everything we had learned about the two characters was thrown into question – are they or are they not the understudies for Waiting for Godot? Or, like the play’s characters, is there also no point to their existence? Beckett’s answer would be that “nothing to be done.” At any rate, these guys really have an existential problem. They wait to be understudies in play. Even when that play is no longer being performed, they still wait and are probably still waiting today. For those familiar with the famous Beckett play, waiting with these guys is worth the time. Waiting for Waiting for Godot plays through October 2nd at Open Eye Figure Theatre.